Ken Haas and daughter Kendal welcome the crowd to the Annual Ken Haas Angus bull sale. 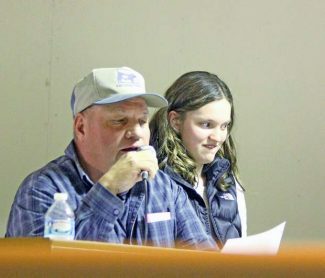 Ken and Heather Haas and daughter Kendall welcomed an excellent crowd of buyers for their 35th Annual sale held at the ranch just west of LaGrange, Wyo. 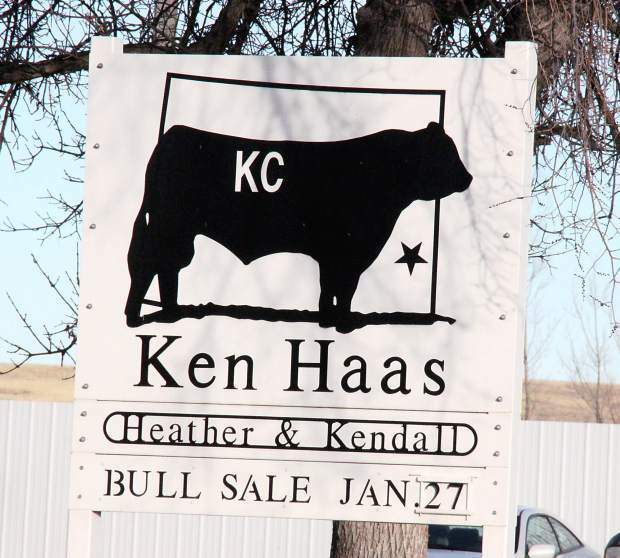 The icy roads from the previous day had cleared up, giving bull buyers near perfect traveling conditions for sale day. Ken Haas has the term "Right Combination" figured out. The bulls in this sale have the right combination of carcass traits, fleshing ability, calving ease and performance. When you hear the term carcass bulls, you sometimes need to adjust your eyes. Not when looking at this set of bulls, they have that "front pasture" eye appeal that you would proud to show the neighbors. Topping the sale was lot 2, a Feb. 8, 2015 son of AAR Ten X 7008 SA. This bull had a moderate birthweight of 77 pounds and weaning weight of 841 pounds The bull has EPDs of BW 0.6, WW 67, YW 128, Milk 22, $B $200.62. Boothill 7 Ranch, Lusk, Wyoming was the buyer at $25,000. Lot 5, is also a Feb. 2015 Ten X son with EPDs of BW 0.0, WW 69, YW 125, Milk 24, $B 163.17 sold to Dalton Baloun, Seneca, S.D., for $16,500. Lot 114, a Feb. 2015 son of VAR Discovery 2240 with EPDs of BW 3.2, WW 67, YW 120, Milk 27, $B 171.90 sold to Dilts Ranch, Douglas, Wyoming, for $13,500. Lot 35, anther Feb. VAR Discovery bull with EPDs of BW 1.5, WW 66, YW 119, Milk 25, $B 155.38 sold to Bridle Bit Ranch, Gillette, Wyoming, for $13,000. Also selling at $13,000 was lot 55, a Mar. 2015 son of KC Haas GPS with EPDs of BW 0.4, WW 59, YW 115, Milk 19 $B 162.86 sold to Dalton Baloun. As usual the lunch was outstanding. 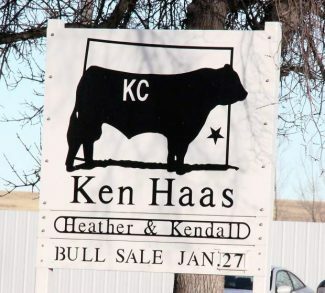 Although I'm sure the ribeye served would qualify for CAB, they were KHAB "Ken Haas Angus Beef" as all the steaks were from cattle bred and raised by Ken Haas Angus. This lunch ranks extremely high on the sale lunch EPD.